We want to come and live underneath your bedroom window ! ...and thus ends the longest hiatus in the history of this blog! We haven't posted since that New Years day in icy Paterson, New Jersey. There are a lot of reasons for that. 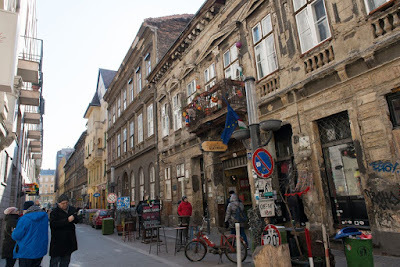 One is the simple realization that my daily life in Budapest is simply not that exotic, and how many more posts do we need about spring vegetables in the local market, or recipes for liver sausage? Of course, if you don't live here you may think it is exotic. 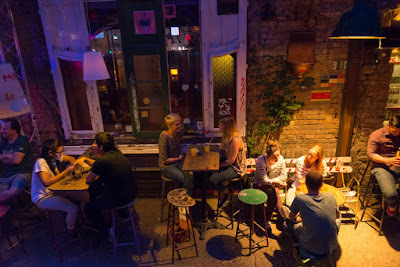 My neighborhood - the historic Jewish Ghetto of Budapest's 7th district - is fast becoming the center of Budapest's drunk and loud nighttime tourism flood. This is not the yacht crowd, or even the seasoned backpacker crowd you may find in a Nepali mountain hut. Think "accounting department of a property management company in Liverpool stag party" meets "football fans from Lyons on a crazy weekend getaway" with beer one quarter the price of what it is in Olde Blighty. It gets noisy. And messy. "Le Grand Rue du Bad Restaurants"
Half the flats in my building have turned into Air B&B rentals or semi legal hostels, indeed half the residences in my neighborhood have become budget rentals for fly-in weekenders and Hungarian flatlanders who flock here for the rebranded bulinegyed or "Party Quarter." Ten years ago there were about four really good pubs in the area - and there were about three "ruin bars" - alternative spaces set up in abandoned or condemned housing. 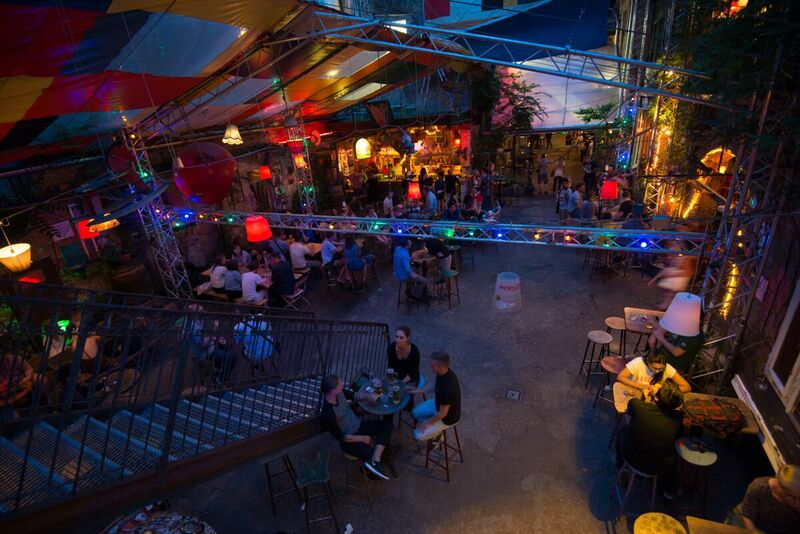 Today the real "Ruin Bars" are all gone, replaced by pricey courtyard garden bistros or by lots of cheap "Eight shots for a five bucks" tourist bars. Then there is the Godzsu Udvar, an uber-kitsch testament to bad taste and disastrous city planning which turned a unique piece of urban history into the food court of a sad mall. The majority of these places are owned by families and companies with close funding ties to the Ruling Party That Rules Everything. The Szimpla, which was one of the original ruin bars, is now a self conscious tourist magnet for those who want to visit something of the alternative past - sort of a hipster ride at Disneyland - but so crowded with tourists at night that they actually have a velvet rope and doormen to face check you as you enter. The Szimpla Kert in the quiet moment before it becomes an Australian backpacker meat market.. Still, the Szimpla - as the oldest and probably the last of the original ruin bars - does keep a sense of community, at least, hosting an organic farmer market on sunday mornings, periodic bicycle markets, and dance houses on some weekday nights. I used to maintain a live and let live attitude towards the changes that were engulfing the 7th district: after all, it maintains its daytime character as the Jewish district and a place where you can get a shoe fixed or a zipper replaced at the corner tailor shop, plus we have an Indian grocery, a cevapcici diner, and a decent cheap Bengali place for cheap take out biryani. But this summer the pressure is building. Local residents are growing angry at the noise levels and the nighty trashing of the streets - on Sunday morning the sidewalks are literally covered in vomit, broken bottles, and yes, excrement. A few days ago I had drunken people - tourists, unless Hungarian drunks have switched to French and Mancunian after midnight - howling beneath my bedroom window until 4 in the morning. 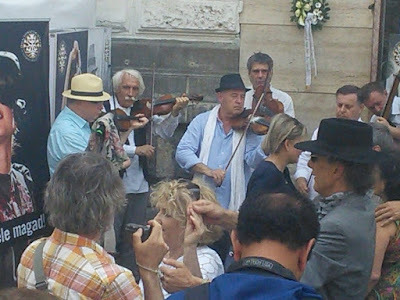 On a lighter note - Hungarian Dance House Day held its annual festival on Ferenc Liszt square and I dropped in for a set by Muzsikas. Muzsikas still top the list of my favorite trad folk bands in Hungary, still kicking after four decades of playing together. The festival was originally the brainchild of Bela Halmos, the fiddler and musicologist who ignited the revival of Hungarian traditional music back in 1971, starting an alternative youth movement that became a way of life. Bela Halmos: a good friend, a great musician. Sadly, Bela passed away a few weeks after I last saw him playing at Tanchaz Napaja in 2013. Since then the event has been held in his honor. Another simple reason for my lack of posts has been technical. My usual digital Nikon coolpix camera has gone insane. Taking photos with it is extremely hit or miss: will it turn on or will it not turn on? How about if I remove the battery? How about if I hit it? Aha! that did it.... so most of the time I use my Nexus tablet , which is not exactly the best option for photography and definitely not convenient. (See the photos above? The nice night time bar photos? Fumie's.) Most people simply tell me to get a smart phone... my answer is no. I am not a smart phone person. I'm not entirely a luddite or technophobe, but I see all those people walking around in the streets with their eyes glued to their little square phones and I know that could easily happen to me.... I could become one of them in a microsecond. Instant internet access. 24 hour Google maps. Apps for everything. Nope. Ain't gonna happen. At least not anytime soon. So we will see if the blog regains its graphic splendor. It all depends on a Nikon Coolpix with mental disorders. FIDESZ 2010. We do not forget easily. 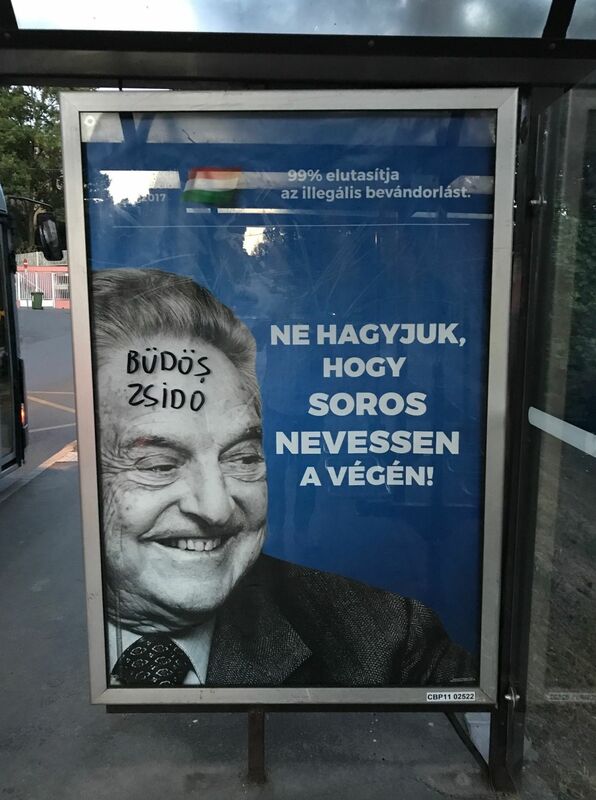 Oh, and we survived the Hungarian election in April. FIDESZ won. FIDESZ always wins. And the poster above tells you why: a photo of George Soros with the words "Don't let Soros have the last laugh!" graffitied - as most were - with the words "Stinking Jew!" So helpful. Thanks FIDESZ. Enjoy your victory.